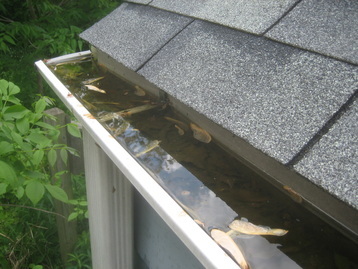 ﻿Rain gutters fill with leaves and other debris causing a huge clog. 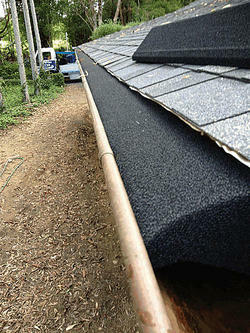 Any gutter system that you may have must be kept clean in order to effectively do its job. Even if you have screens covering our rain gutter , smaller particles will eventually pass the screen and clog your gutters. Gutter cleaning Sacramento understands the importance of gutter and downspout cleaning. It will help avoid expensive repairs. Look for early signs for rain gutter. Stain Streaks on the gutter or erosion in the flowerbed on the bottom. If clogged gutters overflow, it can soak the siding. When this happens it can cause paint to peel or cause rotting wood and damage your roof. Sometimes, if water gets through the interior of your home it can case damage to your roof and foundation. With damp wood comes mold and mildew. With mold and mildew comes disgusting termites. Mosquitoes will also come to the house party. Kingdom Heating & Air, Inc. Sacramento HVAC will make sure your never neglect cleaning and maintaining your gutters. Rain gutter cleaning services in Sacramento is a distasteful chore that our HVAC professionals take care of. The project needs to be completed twice a year or it can result in several problems in the future if it is not corrected. Heating repair Sacramento also makes sure that the condition of your roof is stable to prevent any future disasters. There is gutter protection available in order to prevent leaves and other debris from getting in the gutters at all clogging the downspouts. If you are a customer that would like to avoid cleaning their gutter in the future you should consider gutter cover installation Sacramento.